Sopris released a similar app-based service last May that would use a wearable and AI to listen in on patient visits, capture key information and construct documentation. Patrick Leonard, CEO and cofounder of Sopris Health, described the newer product launching today is an evolution of that service that incorporates everything the company has learned over the past 10 months. “We served tens of thousands of visits with our customers and have worked with several large institutions — we were in the Cedars-Sinai tech accelerator last fall, so we spent a lot of time basically living in Cedars-Sinai in Los Angeles, working with physicians and people there to really get a deep understanding of how they do documentation,” Leonard told MobiHealthNews during a demo of the platform. 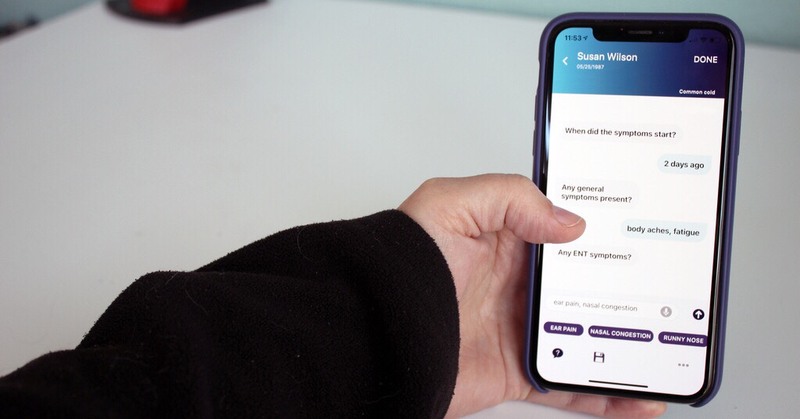 MobiHealthNews’ demo of the inputting process lasted roughly a single minute, and that included pauses to explain and describe the system’s text responses. The rest of the app also included a straightforward navigation menu, options to add a new note or upload another to the wider EHR system, and an unobtrusive help button that Leonard said will immediately connect users to a live chat with the company’s support team. Clinical documentation and EHRs has been a long-standing complaint among physicians — recent findings from the University of California's Riverside School of Medicine, for instance, listed EHRs as one of the biggest contributors to physician burnout. Sopris’ product looks to limit the time doctors spend working on documentation, both in the clinic and at home. Sopris received some interest from investors last year during its $3.4 million funding round, but it isn’t the only digital approach to medical notation. IKS Health’s virtual scribe product was recently employed by the Massachusetts General Physicians Organization, where the group said it saved some doctors over two hours per clinical session. Others include digital assistant Suki, virtual scribe Saykara and wearable-focused Notable.